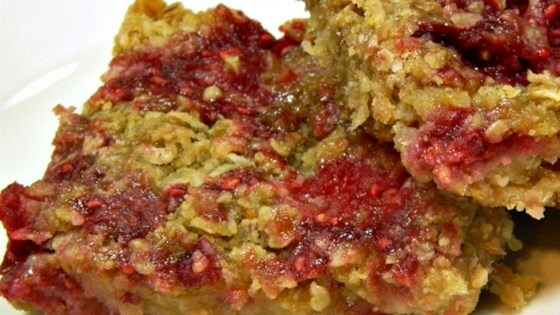 "A sweet raspberry filling surrounded by oats makes a good snack for tea time." Preheat oven to 375 degrees F (190 degrees C). Grease a 9x13-inch baking pan. Mix raspberries, applesauce, oat bran, and white sugar together in a bowl. Combine oats, brown sugar, and butter together in a bowl using a pastry blender; add flour. Continue cutting into mixture using pastry blender until crumbly. Spread half the crumb topping into the bottom of the prepared baking pan. Bake in the preheated oven until crust is lightly browned, about 20 minutes. Remove from oven and cool. Spread the raspberry filling onto the cooled crust and sprinkle with remaining crumb topping. Bake in the preheated oven until topping is lightly browned, about 20 more minutes. Yes, I did make 1 change as did not have the fresh fruit. Used low cal. raspberry jam (1 cup). Maybe would only use 3/4 cup next time but it's very delicious nonetheless.